Cummings - booked for diving in the first half - was denied a penalty in the 55th minute and Hibs boss Neil Lennon's frustration showed after Martin Boyle also saw spot-kick appeals dismissed following Peter Grant's challenge. 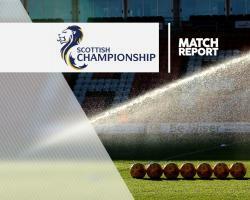 Ambrose headed Hibs in front from James Keatings' free-kick but just 90 seconds later, Falkirk equalised when top scorer Craig Sibbald nodded in Fraser Aird's corner. The leaders were not to be denied, though, and in stoppage time Keatings capped a breakaway move by cutting inside onto his right foot and curling a superb shot into the top corner.